For most bulk materials handling operations, the New Year also brings new onsite challenges and productivity targets to hit. Are your conveyor transfer points, chute areas, screen discharge points and bin liners exposed to constant high impact, harsh and extreme bulk material loads, resulting in significant damage and abrasive wear? 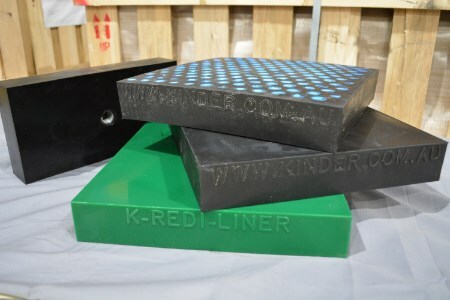 The SOLUTION is K-Redi-Liner® Anti-Wear liners, available for use within a multitude of industries and surfaces. Designed specifically to reduce abrasive wear, extend wear protection and provide impact resistance within the most punishing transfer load zones and particularly within conveyor chutes. Modular, bolt-in system can be arranged in any wear pattern. Lightweight compared to steel liners. Delivers significant noise reduction within impacted areas. Cost savings, easy to install, replace only what’s needed not the entire liner. K-Redi-Liner is available in a range of hardness durometers, formulas to suit diverse applications as well as embedded alumina ceramics for extreme applications.